The sun's out, grill's fired up and we're all ready to go outside! The last thing I want to think about is how smooth my legs are. Shaving can be a pain, let's face it, but EOS has some everyday products to make that not-so-fun task a little more enjoyable. Their line of shaving creams and rich lotions are just what I need to get the job done and have smooth, sweet smelling skin. 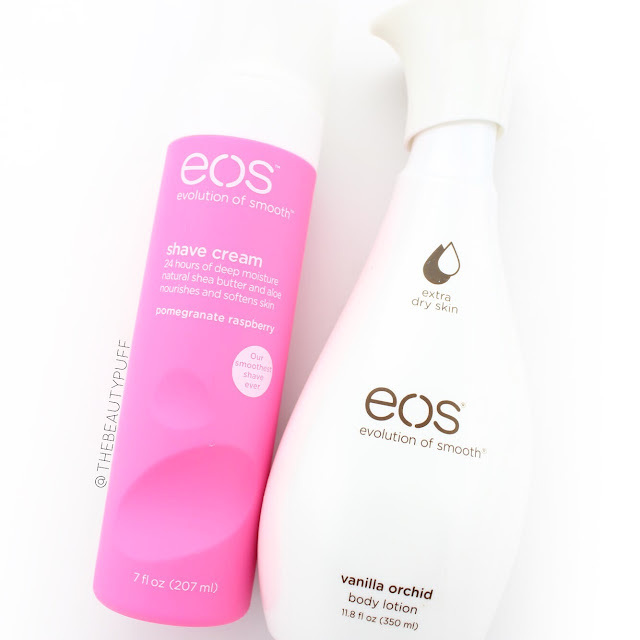 Shave Cream | The EOS Shave Cream comes in four invigorating scents - Tropical Fruit, Vanilla Bliss, Lavender Jasmine and Pomegranate Raspberry, which is the scent I have. The formula is like a light lotion which spreads easily over the skin while hydrating and protecting while you shave. The bottle has a pump so one-handed application is a breeze! I need all the help I can get working around my growing belly so little touches like that, I love! Key ingredients include shea butter, green tea, aloe oat and grape seed extracts. Body Lotion | The EOS Body Lotion comes in three varieties - Delicate Petals, Berry Blossom and a formula for extra dry skin in Vanilla Orchid, my current favorite. The Vanilla Orchid scent is a fresh balance of sweet vanilla and floral which isn't over-whelming. It's ideal for summer because the scent is just enough without feeling heavy. The formula is rich and easy to apply, leaving skin thoroughly quenched without residue. It's the perfect combination for summer if you ask me. It also works beautifully on my sensitive skin without stinging! I use this lotion after shaving as well as on my arms and anywhere else that needs a boost of hydration during the day. The sleek pump looks especially nice out on display in my bathroom too! Key ingredients include cocoa butter, shea butter, soybean and sunflower oil. Ready for extra smooth, sweet-smelling skin this summer? Check out the EOS line on their website and Target.com below.